Sunday January 14th 1900 I was busy about the work a great part of the forenoon Frank Stevens was here. I read in afternoon and evening Monday January 15th 1900 Luther helped me wash this forenoon. Will went down to Riverside by train to see about getting feed. In the afternoon ripped up an old cloak to fix. read in evening. 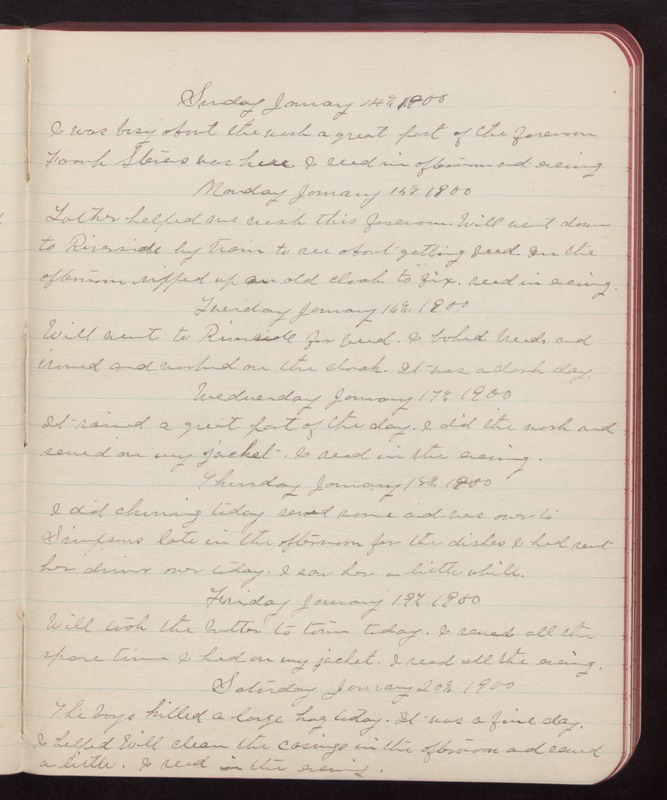 Tuesday January 16th 1900 Will went to Riverside for feed. I baked bread and ironed and worked on the cloak. It was a dark day. Wednesday January 17th 1900 It rained a great part of the day. I did the work and sewed on my jacket. I read in the evening. Thursday January 18th 1900 I did churning today sewed some and was over to Simpsons late in the afternoon for the dishes I had sent her dinner over today. I saw her a little while. Friday January 19th 1900 Will took the butter to town today. I sewed all the spare time I had on my jacket. I read all the evening. Saturday January 20th 1900 The boys killed a large hog today. It was a fine day. I helped Will clean the casings in the afternoon and sewed a little. I read in the evening.